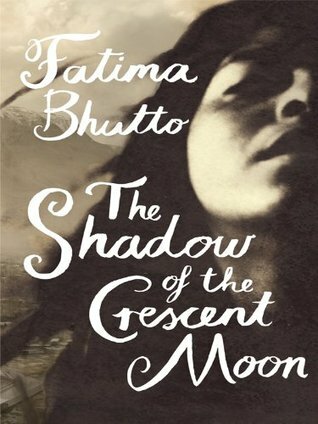 The Shadow of the Crescent Moon is the first attempt at fiction by the Pakistani poet, Fatima Bhutto. The story revolves around a family comprising three brothers in a small town (Mir Ali) located in the Federally Administered Tribal Area (FATA) of Pakistan. One the morning of Eid, three brothers gather for breakfast and then head towards different mosques to offer prayers; the first time when each of them are going to different mosques. The eldest brother, Aman Erum, doesn’t want to be confined to the boundaries of Mir Ali and wants to leave the place and explore the world and run a successful business. The second brother, Sikandar is a doctor practising in a government hospital in Mir Ali who is troubled by the loss of his son and more so, by his wife’s new habit of gate-crashing into funerals of strangers. The third brother, Hayat, is an idealist and a Pashto nationalist fighting against the ruthless state of Pakistan and its institution, thereby following in the footsteps of his father. He is even part of an underground rebel group in the local university at Mir Ali. Apart from that, there is a romantic sub-plot between Aman Erum and a young beautiful girl, Samarra, who is very fond of Mir Ali and doesn’t want to leave the place; thereby having a conflicting view as compared to that of Aman Erum. The three brothers await terrible incidents to unfold over the course of the next three hours. The fact that the Fatima Bhutto is a poet was definitely a plus, with regard to the book, it was a well written prose, with certain abstract expressions and a lot of scenes left open to the reader to conclude after giving sufficient input. I felt the character of Aman Erum and his fiancé Samarra was really well built, and how they had conflicting ideas and how they tried to handle them and also; the character of Sikandar, a pragmatic man living in the reality, and his wife Mina, unable to come to terms with the death of their son, was also a good aspect of the novel. Apart from that, the author also took up a story based in a less known area of Pakistan, rather than the plots that usually revolve around Karachi, Lahore or Islamabad. With that said, the plot was very poorly structured; the events were supposed to be happening on the same day and a chapter starts with a time of the day. However, very little happens on that day and instead, the book is filled with flashback and other events surrounding it rather than the actual present and within the same chapter, the book went back and forth within the present and the flashback. Moreover, despite the author’s half-Pashto roots, I still find it odd; considering I reasonably know that FATA is extremely conservative and Samarra seems like a typical upper middle-class woman from Islamabad rather than someone from Mir Ali. Just to add further to that point, the author used her setting very little; the description of Mir Ali was very shallow and considering she was eyeing a global audience, she should have described the insurgency in more detail, regarding the factions involved – considering she mentions both a civilian rebellion and the fundamentalist taliban and she barely touches upon whether the two were in any way connected. I picked up this book from the library purely because of her last name, considering her grandfather Zulfikar was the former Prime Minister, succeeded years later by her aunt Benazir and the other members of her extended family too, being politically involved. I felt the book had a great potential but it was very poorly taken forward for the first 150 pages, and then ended very abruptly with abstract endings. The author took a courageous political position to criticise the military establishment of the country, but the hatred might probably arise from the history of her family with the institution, well expressed, nonetheless. This could have been a fantastic book with a little more details and being presented as a fine 325-350 page novel rather than the 230 page novel that it was. I still feel that the author’s writing was promising, I enjoyed her flow, but not exactly her plot and thus, I would be looking forward to her future works, but regarding this particular work, I would award it a rating of four on ten. This is a short biography by Hourly History of the American Civil Rights activist during the late 19th Century, Frederick Douglass. 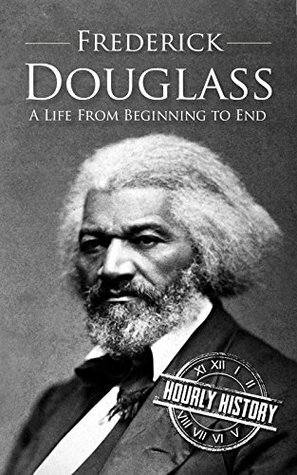 The book starts with the practice of slavery in the United States, followed by the early life of Frederick Douglass and his eventual escape from slavery, becoming a well-known orator and writer and eventually, an activist for abolition of slavery and equal voting rights for African Americans and women. The book started well, giving a background into the practice of slavery, the punishment for escaping and the risks involved and the eventual escape by Douglass. The book also elaborated well on his activism and his quest for acquiring knowledge and also, had a touch upon his personal life. To be fair, I have heard of activists such as Rosa Parks, Harriet Tubman or Martin Luther King Jr. but I had never heard of Frederick Douglass and considering that position, I felt that the book gave me a good insight into the personality as well as the history of slavery in the United States. I felt that the book overrated his bid for the office of the Vice-President of the United States, considering, he didn’t run for any major party and attained negligible votes. Even if the book had to mention that, they also should have given the information that he ran along with an independent and didn’t secure significant votes. I enjoyed reading the book, I feel Douglass is not a personality touched upon by many of the books on Civil Rights movement, unlike the others I have already mentioned and I am glad that I read the book. I would award the book a rating of seven on ten. Six years ago, I posted a book review of Ian Rankin’s Knots and Crosses and back then, I never expected this habit of mine to last this long. The original intention was to retain the habit of writing so that someday, I can release a book of my own; while that ambition still exists, I am no longer scared of losing the habit of writing but then, I find reviewing an effective way of remembering the books that I have read and also, the added incentive is that you get to know a lot of new people from around the world, mainly authors. I wrote a similar post when my blog reachedthree years and thus, I shall not repeat many of those points but I would just focus on what I have managed to achieve among the targets that I set myself three years ago and what I haven’t and in case I haven’t achieved, I need to plan on achieving those rather than setting fresh objectives with little hopes of achieving the same. There has been absolutely no change in the design; rather, I would say it is status quo ante bellum as I tried to make changes, only for it to come back to the same shape in no time. I have no clear plan on how I am going to go about it this time around, maybe, I can hire someone to make it better and I shall do it before the next time I write such a post. Status: No change and not bothered to change it. I pointed out a concern that my reviews of TV drama shows fetched lot more views than all my book reviews combined. However, my objective is to post reviews of books I read and I am not bothered about the popularity that they get or the readers that they fetch, I primarily do this for my own satisfaction. If people prefer reading my reviews of TV drama, I am happy, and that wouldn’t change my focus and I shall continue to keep writing book reviews. Three years ago, there was a heavy concentration on the genre, Mystery, Crime and Thriller at nearly 50% of the total number of reviews and today, its share has come down to 21% and I have 19 different categories to measure this and no genre other than the aforementioned one has a share of over 15%. To that extent, I am satisfied to the extent of which I have achieved diversity though; I shall not stop working towards increasing it further. I have an idea and I hope before the next time I make such a post, I make a decent script before finalising it and trying my luck at getting it published. This time I am more determined than the other occasions that I have tried. I have had a pleasure writing all these posts over these six years, I shall continue doing so for a long time to come and I thank each of my readers for this continuing patronage and support for the content that I am writing. ‘History with the nasty bits left in! The Awesome Egyptians gives you some awful information about phabulous Pharaohs and poverty-stricken peasants – who lived an awesome 5,000 years ago! · Which king had the worst blackheads? · Why some kings had to wear false beards? · Why the peasants were revolting? 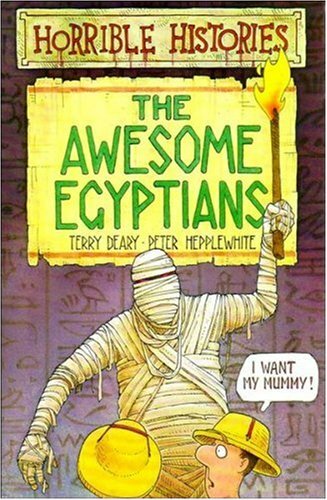 This is a book on Egyptian History from the Horrible Histories Series from Terry Deary and Peter Hepplewhite. The book is filled with interesting facts, funny illustrations and anecdotes, primarily intended for school children. The book covers nearly every popular aspect of Ancient Egypt such as how life depended on the river Nile, the pyramids, certain myth busting on pyramids (it was not necessarily a grave! ), famous pharaohs, the ancient Egyptian gods and goddesses, the rituals, about mummies and finally, certain instructions on creating ancient Egyptian devices and cuisine. The book had some really good illustrations, mixed with a lot of humour. Additionally, I also liked the fact that the book covered most of aspects of Egypt that we might have heard of but not necessarily know about. The book also gave the right focus on not just the aristocracy, but also the lifestyle of the common people in Ancient Egypt. This book communicated history in a very interesting manner, especially considering the target audience of the book and making a page turner out of a topic like history is quite an achievement in itself. The only aspect I felt was that the proportion of jokes in the book could have been reduced a little, beyond a point, it just got repetitive and of course, diluted the content of the book considering there are only 126 pages in total. I read this book seven years ago (when I was in school) and enjoyed reading it then, and even today, my enjoyment was not any less and it satisfied every expectation that I normally have from a Horrible Histories book. On the whole, I would award the book a rating of seven on ten. This is a short summary of the events surrounding the Dutch ship, The Mayflower, famous for carrying around 100 pilgrims from England to the New World on a very dangerous journey across the Atlantic. The book started well, explaining the various conflicting views within Christianity, how the pilgrims differed in their views and their desire to remain English but be able to practice their religion without the threat of heresy. The book then talks about the Mayflower ship, the survivors of then journey, the establishment of the colony in the New World, the eventual conflict with the natives and touched upon the formation of the United States of America in the conclusion. I felt the book had a right mix of focus on the various events, and to be honest, I had very little knowledge on the whole episode before reading this book. The book went step by step in a proper manner, explaining who are the pilgrims, why they demanded a separate state and what were their beliefs. The book then talked about the conditions in the ship and the eventual lifestyle in the New World. 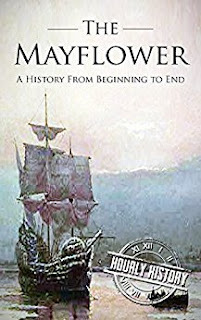 So, I felt this book was really good in its content and coverage and could easily help you understand the events surrounding The Mayflower voyage. However, I felt that the title was a bit of a misnomer, the book focused very little on the actual voyage in itself and focused on the events before and after the voyage. Despite the fact that this journey is considered one of the most iconic moments in American history, I would have preferred it if there was a little more about the voyage in itself. Based on what I have stated, I would award the book a rating of seven on ten.